Chrysanthemum Pu-erh Mini Tuocha consists of fermented Pu-erh tea, blending in proper amount of chrysanthemum petals, individually compressed in small bowls and individually wrapped. One tuo weighs approximately 5 grams, each tuo makes one cup (plus repeat infusions). The taste is pleasant with a sweet mellow flavour. A rewarding way to enjoy Pu-erh. 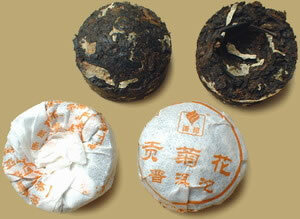 PREPARATION: To prepare Mini Pu-erh Tuocha, place one in a teapot. Rinse by covering with boiling water and quickly pour off. Cover with boiling water again and let steep 5-30 seconds (depending on how light or dark you want the tea) and serve. After the first infusion the tea has just gotten started so keep on infusing. Pu-erh tea can be steeped 10-20 times.